I stepped into the theater this week to view a film that I had been warned was a talking film. A film absent of any violence or action. A film with class and greatness. This was one of my most anticipated films from the second I originally caught the trailer during my viewing of Hereafter last year. I only regret that it took so long to view it. The film opens with Prince Albert, Duke of York (Colin Firth) attempting to give a speech, only to be left, well, speechless. It is then that he attempts to get help for a stammer that he’s had since childhood. After many failed attempts, his wife (Helena Bonham Carter) ventures to a unique Australian’s office; a man by the name of Lionel Logue (Geoffrey Rush). After this meeting, the film picks up in a blend of excitement, comedic antics and sheer joy. So much so, that after one particular scene, I found myself attempting to hold in laughter for the next three. Colin Firth’s performance was very worthy of the Best Actor Academy Award he won, as well as the Golden Globe. Geoffrey Rush was of equal performance. Perhaps that’s why he was nominated for a Best Supporting Actor Oscar, as well as the Golden Globe. Overall, this film is one of the greatest that I’ve ever witnessed and I recommend it to anyone with a Kingly heart, or for that matter, any noble human being willing of great and unique film viewing. 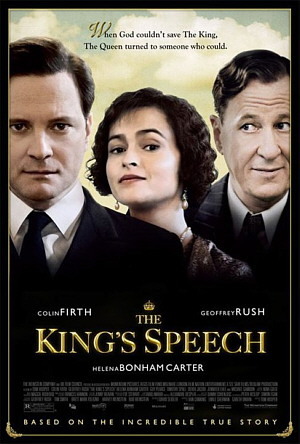 Comments for “The King’s Speech” (2010) – A Review are now closed.